This package has CNA (Nursing Assistants) Review Student DVD/Streaming Video Lecture package and Clinical Skills Competence component to help student go through the first two steps of challenging the CNA Exam. The lecture DVDs and Streaming Video assist students to learn all the 16 units essential in making them competent Nurse Assistants and be able to work either in the hospital floor, nursing home facilities or home health care. Meanwhile, the Clinical Skill Based Training is designed to demonstrate all the skills that CNA (Nursing Assistants) need to master before going to the skill based exam. The training demonstrates each skill in details and makes it easy for those who need an extra teaching of the skills or student who prefer not to attend traditional classes for training sessions. 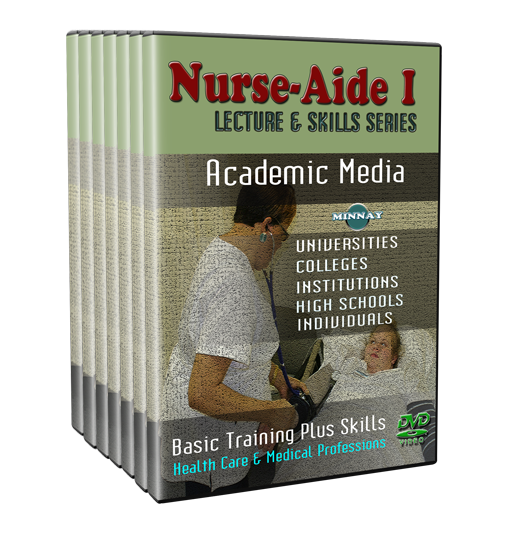 It saves you a lot of TIME to learn the entire course of Nurse Aide I from this video set taught by the good and reputable university and college educators. Bonus 3000 plus InterActive Practice Exam Questions and Answers accessible anywhere; optional with Full DVD/Video package. Lecture Training for CNA DVDs and Video Streams are designed to take a student through all the modules that CNA (Nursing Assistants) need to master before going to the theory exam. The CNA DVDs and Video Stream trains the student systematically and it easy for those who need an extra teaching of the theory and concepts of Nursing Aide-I (Nursing Assistants) or student who prefer not to attend traditional classes for training sessions. Among other conceptual requirements, there are presently 15 specific nursing modules that must be learned for a nurse aide student to become a CNA ((Nursing Assistants). These 15 modules are covered by candidates attending the NURSE AIDE TRAINING PROGRAM or watching this CNA-DVD/Streaming Video. Testing on any of these modules may occur when a graduate of the program takes the Nurse Aide exams (State Boards). Skill 26-Documenting on medical record. Skill 28-Putting on & taking off mask & protective eyewear. Skill 29-Putting on & and Taking off gown and gloves. Skill 30-Removing contaminated disposable gloves. Skill 31-Disposing of equipment from unit with transmission-based precautions. Skill 32- Collecting specimen from resident under transmission-based Precautions. Skill 33-Performing relief of choking. Skill 34-Feeding client who cannot feed self. Skill 36-Providing fresh drinking water. Skill 39-Making Occupied bed (Part I). Skill 40-Making Occupied bed (Part II). Skill 41-Assisting with oral Hygiene (minimal assistance from nurse aid). Skill 42-Providing mouth care (minimal assistance from resident). Skill 43-Providing mouth care for unconscious resident. Skill 44-Assistance with denture care. Skill 45-Cleaning and storing dentures. Skill 46-Cleaning & trimming nails/providing fingernail care on one hand. Skill 50-Dressing Client with affected (weak) right arm. Skill 51-Giving complete bed bath. Skill 53-Giving modified bed bath. Skill 54-Giving tub bath or shower. Skill 57-Measuring & recording oral temperature (non-mercury glass thermometer). Skill 58-Measuring axillary temperature (non-mercury glass thermometer). Skill 59-Measuring rectal temperature (non-mercury glass thermometer). Skill 61-Counting and recording radial pulse rate. Skill 64-Measuring and recording blood pressure (manual). Skill 66-Measuring combined vital signs: oral temperature, pulse, respiration and blood pressure. Skill 67-Measuring height and weight. Skill 68-Measuring and recording weight. Skill 69-Measuring and recording fluid intake/output. Skill 70-Measuring and recording urinary output. Skill 71-Assisting with use of bathroom. Skill 72-Assisting with use of bedside commode. Skill 75-Emptying urinary drainage bag. Skill 77-Applying and caring for condom catheter. Skill 82-Assisting with coughing and deep breathing exercise. Skill 83-Applying and removing elastic stockings or TED hose. Skill 86-Assisting to ambulate using cane or walker. Skill 87-Applying transfer belt (gait belt). Skill 88-Using mechanical lift (Hoyer). Skill 89-Preforming range of motion exercise. Skill 90-Preforming passive range of motion (ROM) for one knee and one ankle. Skill 92-Assisting to dangle stand or walk. Skill 93-Assisting client to ambulant. Skill 94-Transferring from bed to chair. Skill 95-Transferring from bed to stretcher. Skill 96-Moving up in bed. Skill 97-Moving up in bed using turning sheet. Skill 98-Positioning resident on side. Skill 100-Applying safety belt restraint.